A new online search facility has been launched in Singapore. It's a joint venture between a publisher of the biggest local newspaper and a Norwegian firm. It's called Red Nano. Why? I guess Singapore's also known as a red dot. Now the dot's getting smaller with them naming it nano. 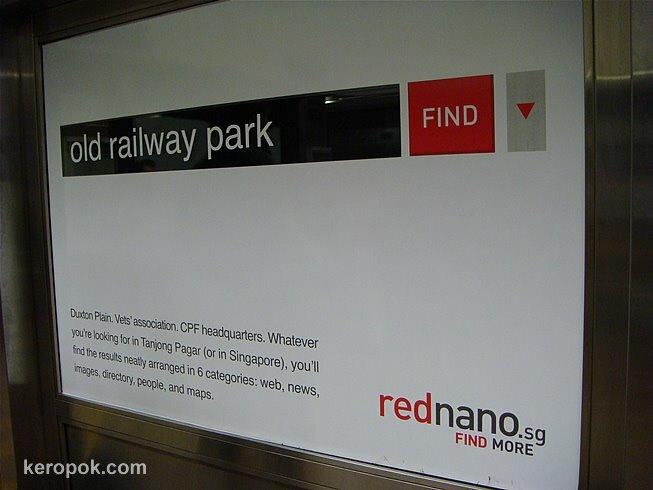 RedNano's are very aggressive in their advertising. Their ads have been appearing in the local papers. Earlier today, I saw this on the underground trains stations. Google is the one that I always head to these days, but I held on to Altavista for a long time. Metacrawler is a good one too. i usually use google too. but like today if they keep asking for some captcha thingy, i switch to others like yahoo. wonder why it keeps prompting! Google is one of my favorites. It is hard for others to get into the fields they are in.